Emotional, touching, heartbreaking, and yet so breathtakingly beautiful!! 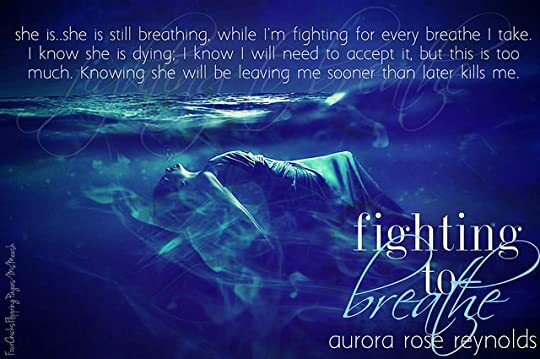 These are some of the words that comes to mind when I think of Fighting To Breathe by Aurora Rose Reynolds. This book was an emotional gripping tale of loss, love, acceptance and second chances. Fighting to Breathe is one of those emotional tales that you must experience. Experience the loss, heartache, sadness, anger, love, and most importantly learning to cope whether it be losing someone you love to death or letting go of a first love. When we really think about it, breathing is what we do and need to survive. Like every breathe, it represents every moment of our life. And in this book, Ms, Reynolds takes readers on a emotional journey of Lea Lamb and Austin Wolf as they struggle with their past and what the future holds for them. Can someone who is drowning in sorrow find the reason to breathe? Lea and Austin's journey to forgiveness and second chances instantly stole my heart. I loved that Ms. Reynolds showcased pure raw emotions that every readers could understand and feel. This book was a heart-tugging read that hit home for me because losing someone is something that everyone deals with differently. But what I loved about this book was that she didn't just make us feel the pain, loss, and sadness but she allowed her readers to believe in the power of hope and love. Hope that tomorrow will be better. And most importantly, love heals. What I loved about Fighting to Breathe was the simplicity and how Ms. Reynolds reminds us that life is too short. Life is about living. And living is breathing. So if you are looking for a book, where readers are reminded to take a deep breathe and let go. Let go of the emotional burdens, let go of the anger, let go of the sadness... and just breathe.